Home | Newsroom | News Releases | Photo Release -- First Northrop Grumman-Built U.S. Coast Guard Cutter Bertholf (WMSL 750) Commissioned in Ship's Homeport of Alameda, Calif.
Photo Release -- First Northrop Grumman-Built U.S. Coast Guard Cutter Bertholf (WMSL 750) Commissioned in Ship's Homeport of Alameda, Calif.
ALAMEDA, Calif., Aug. 4, 2008 (PRIME NEWSWIRE) -- Today the Northrop Grumman Corporation-built (NYSE:NOC) National Security Cutter USCGC Bertholf was commissioned on the U.S. Coast Guard's birthday, becoming the service's most capable and technologically-advanced maritime asset in its 218-year existence. "I know firsthand that the ship we commission today will be the most capable ship that the Coast Guard has ever sailed," said Rep. Elijah Cummings from Maryland's seventh district. "Hopefully our children will look back on this day of Aug. 4, 2008 and say that under their watch, they created a great ship, and that ship is going out to defend our way of life, guard our borders, interdict drugs and make sure our nation is safe." Meryl Chertoff, the ship's sponsor and wife of the Department of Homeland Security Secretary Michael Chertoff, ordered the men and women of the Bertholf crew to "man our ship and bring her to life." 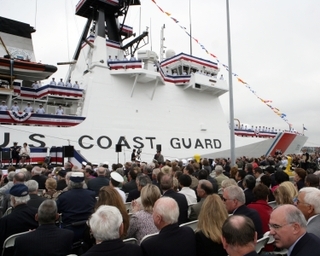 The crew responded with an "aye aye ma'am" and double-timed it through the 2,500 spectators on Coast Guard Island in Alameda, Calif.
"Northrop Grumman's shipbuilders - some 40,000 of them - could not be more proud to build and deliver these brand-new assets to the Coast Guard," said Mike Petters, corporate vice president and president of Northrop Grumman Shipbuilding. "Bertholf is the flagship of the fleet-the largest and most technically advanced class of cutter the Coast Guard has ever known." In partnership with the U.S. Coast Guard, Northrop Grumman and Lockheed Martin, the joint venture partners of Integrated Coast Guard Systems, have been working side-by-side to design a ship that is not only capable and flexible, but also an economical and enduring platform. "We are in an era of a persistent conflict, with hazards and threats to be dealt with," said U.S. Coast Guard commandant Adm. Thad Allen. "This ship represents a remarkable step forward, not only in capability and capacity, but also in the competency of this crew. Today, the crew will bring this ship to life and Bertholf will be up to the challenges of the 21st century." U.S. Coast Guard Capt. Patrick H. Stadt, of Ft. Belvoir, Va., assumed command as commanding officer of Bertholf. The ship will be homeported in Alameda. Bertholf, is named to honor Commodore Ellsworth P. Bertholf, the first commandant of the U.S. Coast Guard. The ship is 418 feet long, with a 54-foot beam. Powered by a twin-screw combined diesel and gas turbine power propulsion plant, the NSC is designed to travel at 28 knots maximum speed. The Coast Guard's newest and most capable Deepwater cutter, USCGC Bertholf (WMSL 750), the first of the Legend Class, was commissioned into the fleet on the Coast Guard's 218th birthday.